There's nothing like sitting down to a homemade, family style dinner mid-week to reenergize yourself to finish the week strong! 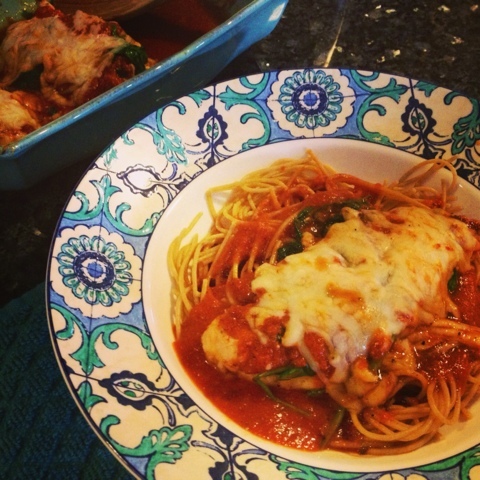 Tonight we're whipping up our version of chicken parmesan. Our recipe has all the cheesy deliciousness & fresh tomato goodness we crave from Italian cooking but holds the breading & frying along with the unneeded calories. 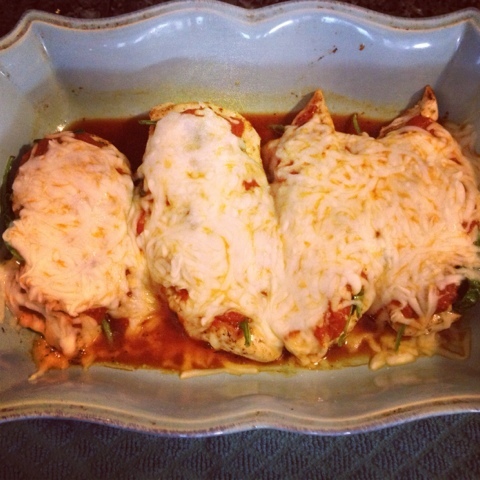 And the best part, our chicken parmesan comes together in under 30 minutes but tastes like it's been cooking all day! We start by seasoning up our thinly sliced chicken breast with garlic, salt & pepper and grill it up to a golden brown perfection. Grilling it leaves the center tender and juicy but creates a crispy, crunchy finish. We top it with fresh sautéed spinach, homemade tomato sauce and mozzarella cheese and broil it up to a bubbly, brown finish. 1. In a saucepan, add crushed tomatoes and season with garlic, onion, oregano, Parmesan cheese, salt & pepper. Bring to a simmer and cook 10 minutes for flavors to combine. 2. Season chicken with salt, pepper and remaining tsp of garlic powder. Heat grill pan to medium-high heat and cook for 4-5 minutes on each side until cooked through. Remove chicken and set aside. 3. Add spinach to pan and sauté 2-3 minutes until softened. 4. 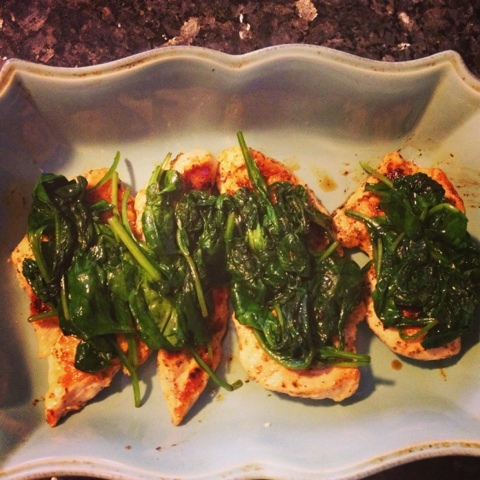 Add 2 tbsp of sauce to baking dish & layer in chicken, spinach, tomato sauce and a tbsp. of mozzarella cheese to each chicken breast. 5. Broil on low until cheese is melted, brown & bubbly ... about 3-4 minutes. What an interesting twist on a favorite dish of mine. I absolutely love all of y'all's recipes that I know I can definitely try in my new kitchen at school.